CraftyCarolineCreates: Stationery Set with Flurry of Wishes, Irene's version. Stationery Set with Flurry of Wishes, Irene's version. Stationery Set with Flurry of Wishes by Irene. 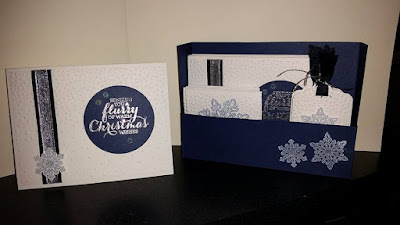 Well a few weeks ago, a lovely demonstrator from the US, shared with me some Christmas versions she had made using my favourite Flurry of Wishes stamp set. You all know that Night of Navy and Silver heat embossing is one of my favourite combination, so this one went straight to my heart. But I think this one in Island Indigo is probably my absolute favourite. 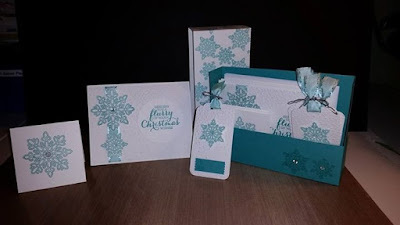 If you have been inspired to recreate any of my projects, please do share them with me, either by email or on my Facebook page, www.facebook.com/craftycarolinehelwigh It really does make my day.